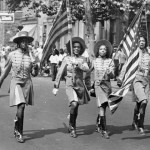 Labor Day festivities grew more elaborate in Philadelphia in the 1940s to include increasingly extravagant celebrations, primarily with parades by worker organizations, unions, and fraternal orders. The four young women marching on Christian Street in this image from the 1941 Labor Day parade were part of the celebratory color guard for the Quaker City Drum and Bugle Corps, a subgroup of Philadelphia's Improved Benevolent and Protective Order of Elks of the World (IBPOEW). The IBPOEW began in 1897 as an African American alternative to the racially restrictive Order of Elks. The Philadelphia IBPOEW Quaker City Lodge #720 began in 1926 and accepted thousands of working-class African Americans as members. Members of the Quaker City Lodge and their children participated in the Drum and Bugle Corps, wearing elaborate costumes and performing routines to provoke the crowd's excitement. This view from the Camden side of the Benjamin Franklin Bridge shows vehicles leaving Philadelphia on the Friday before Labor Day in 1953. 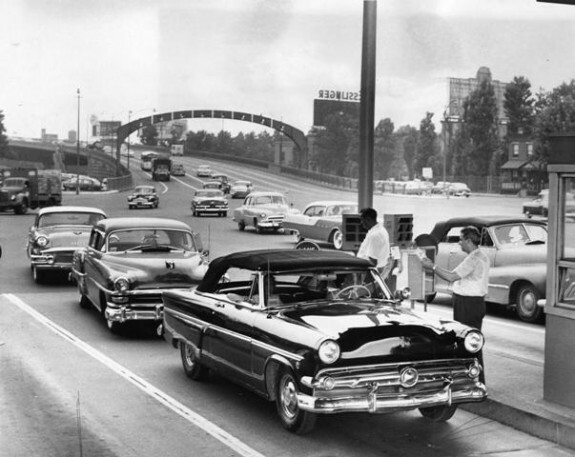 As thousands of families left Pennsylvania for the New Jersey shore, police and rescue workers throughout the Mid-Atlantic came up with a campaign to get people to drive slower. The bridge maintenance workers pictured here warned drivers about the dangers of speeding and gave them a pamphlet containing safety tips for traveling. 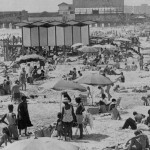 Crowds of people opted to leave the city of Philadelphia over the Labor Day weekend to travel to the beaches of New Jersey. 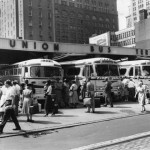 For working-class families, the growing availability of mass transit was welcome, with buses providing cheap transportation away from the city and allowing them to travel with more family members than would fit in a single car. 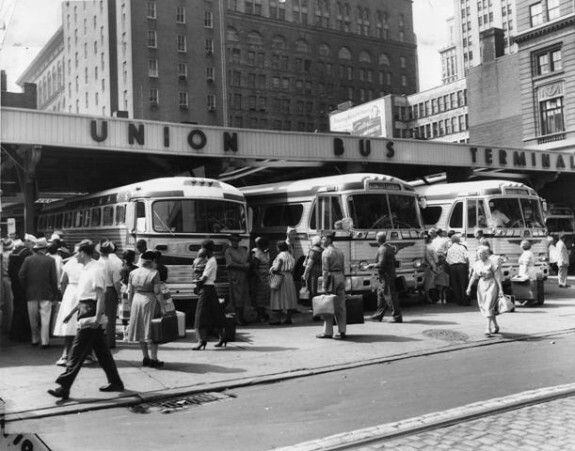 Philadelphia's Union Bus Terminal, located on Filbert and Thirteenth Streets, scheduled additional buses to Atlantic City around Labor Day weekend to handle the volume of travelers. Hordes of people, pictured here on the Friday before Labor Day in 1957, stood in lines at the busy terminal, waiting to board and get a step closer to starting their vacations. As the destination for some Labor Day travelers, Atlantic City, New Jersey, offered families the opportunity to enjoy a variety of entertainment. Pictured here in 1979, the beaches of Atlantic City first became a popular Labor Day playground in the early twentieth century. 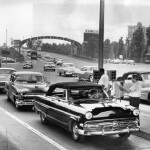 The number of people lounging on the beach, walking the boardwalk, and riding amusements declined in the 1950s and 1960s, as crime rates increased, other destinations beckoned, and tourism slipped. The legalizing of gambling in the city in 1976 led to the construction of new casinos and resorts in Atlantic City, drawing more tourists and more entertainment in casino showrooms. On Thursday, September 1, 1960, members of the Transport Workers Union of America (T.W.U.) 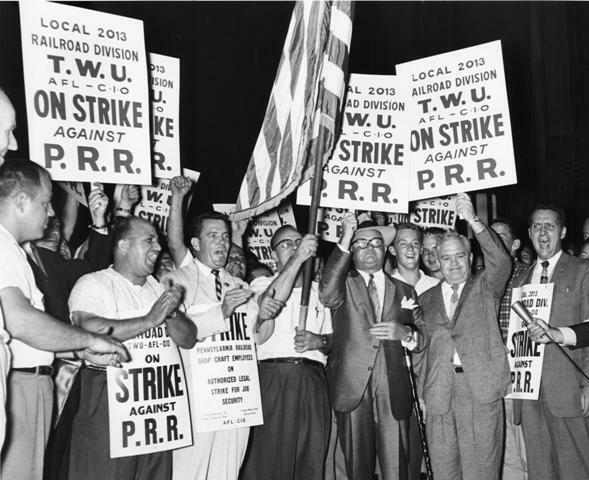 began a twelve-day strike against the Pennsylvania Railroad, reinforcing Labor Day's celebration of workers’ rights. The T.W.U. protested the railroad’s attempts to dissolve the position of fireman on new trains and limit employee salary increases. 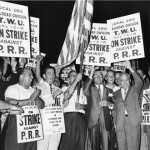 Labor Day fell on the fourth day of the strike, and T.W.U. strikers stood outside 30th Street Station holding banners and noting their grievances as parades and celebrations occurred throughout Philadelphia. Pictured here on the first day of the strike are T.W.U. 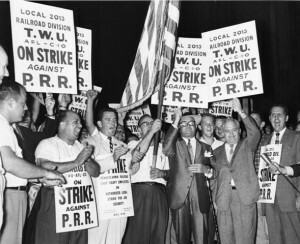 President Mike Quill (front, wearing a hat) and International Brotherhood of Teamsters officer Frank Sheeran (right of Quill) with union members in front of 30th Street Station. Labor Day, celebrated the first Monday of September, has been observed in the Philadelphia region since the 1880s, before it became a nationwide holiday. New Jersey was one of the first states to grant Labor Day legal status in 1887, and Pennsylvania followed suit by the end of the decade. The earliest incarnations of Labor Day grew from unrest among industrial laborers, but over time the holiday weekend also became a time for family activities and trips to the Jersey Shore. The first celebration of Labor Day occurred in New York City on September 5, 1882, when an estimated 10,000 garment workers held a parade that ended in a picnic with labor-oriented speeches and family activities. The success of the first Labor Day led New Jersey, Pennsylvania, and other states to adopt similar celebrations and create legislated holidays. An act of Congress on June 28, 1894, made Labor Day a federal holiday. Two New York labor activists, Peter J. McGuire (1852-1906) of the American Federation of Labor and Matthew Maguire (1855-1917) of the Knights of Labor, both have been credited with the idea of making Labor Day a national observance. 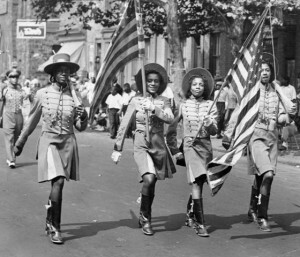 In the Philadelphia area, Labor Day followed the pattern of the original observance in New York, with parades to show the solidarity of the workers followed by festivals for workers and their families. Dominated at first by the region’s textile unions, Labor Day attracted additional workers as the labor movement grew in prominence and the size of the parades and number of participants grew. In 1900, the region’s Labor Day celebration included 15,000 people from various ethnic and labor backgrounds celebrating together at Washington Park on the Delaware River in Gloucester, New Jersey. For several years, however, harmony among labor unions broke down and Philadelphia had two parades as workers became divided over supporting or opposing socialist parties. Early Labor Day celebrations honored those who worked, but they also showed the power of the unions as they sought an advantage in negotiations over hours and wages. In 1905, the forces of labor reunited for a single parade of 30,000 laborers to show solidarity as most wage agreements were due to expire in May of the next year. 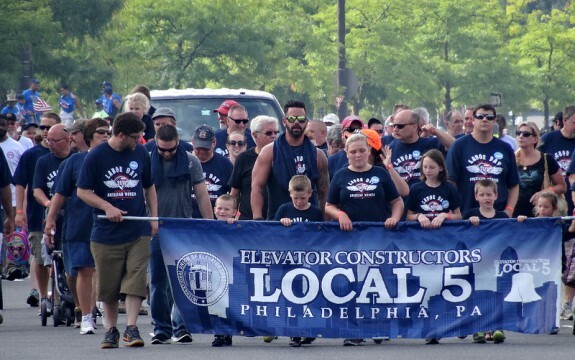 The parade assembled at Broad Street and Girard Avenue and marched down Broad to Christian, then marched back into the city to Chestnut, to Delaware Avenue, to Arch Street, where the laborers took the Arch Street Ferry to Washington Park for family celebrations. While the parade was a key feature in this and other years, speeches by labor officials and politicians after the parades called attention to the condition of workers before unionization and focused on the civic and economic values behind the holiday. In the early twentieth century, Labor Day changed as the growth of public transportation systems and automobile ownership allowed many city-dwellers to travel over the holiday weekend. 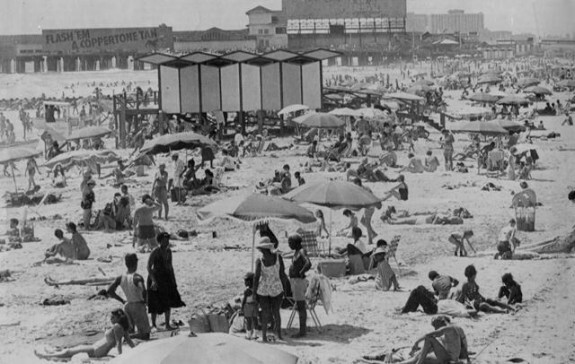 Trips to the beaches of southern New Jersey became a tradition of Labor Day celebrations in the area. In 1914, for example, Atlantic City expected 50,000 or more Philadelphians to make the trip to the shore. Labor Day also changed with transitions in the industrial economy. Celebrations were low-key and quiet during the Great Depression, even though membership in labor unions grew. With the economy fragile and the availability of work limited, workers did not want to risk their jobs. With the start of World War II, industry boomed and the economy recovered, and Labor Day returned to its pre-Depression style of celebration. Southern New Jersey beaches continued to be popular destinations with attractions for the entire family. The Labor Day parade remained a staple of the holiday but changed in scope to become more patriotic and family-oriented while still showing worker solidarity. 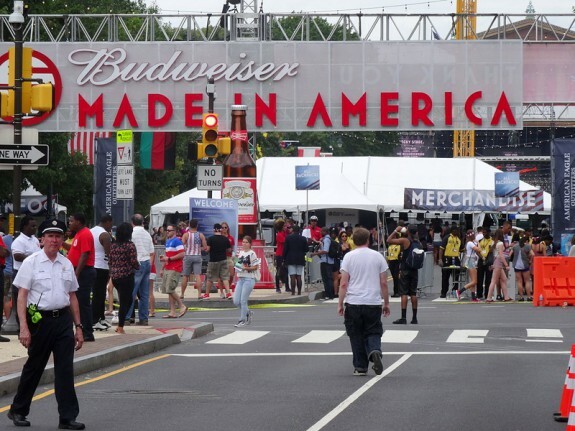 Labor Day also changed significantly as the Philadelphia region shifted from production to the service economy, which meant fewer manufacturing jobs but a growing prominence of unions representing government employees, teachers, and others in the public and service sector. The ideas of workers’ rights and solidarity associated with the first Labor Day celebrations continued to resonate with some, but as the Philadelphia area suburbanized, Labor Day celebrations became smaller and dispersed through many small towns. Big city parades, whether in Philadelphia or Wilmington, Delaware, did not attract as much attention. The holiday became associated more with commercial sales and end-of-summer rituals than with the interests of labor. During election years, it also signaled the kick-off of political campaigning as candidates participated in Labor Day events to connect with voters. 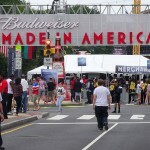 Beginning in 2012, the Made in America music festival on the Benjamin Franklin Parkway became a hallmark event of Labor Day weekend in Philadelphia. Although union rallies continued to occur, the view of Labor Day as an extended weekend to be spent with family or on the beach remained a mainstay in the region. Scott Hearn earned his master’s degree in history at Rutgers-Camden. Lurie, Maxine N., and Marc Mappen. Encyclopedia of New Jersey. New Brunswick: Rutgers University Press, 2004. Dassaro, Jennifer. “The Origin of Labor Day and the Labor Day Parade.” Social Science Docket 10, no. 2 (Summer/Fall 2010): 37. Grossman, Jonathan. “Who Is the Father of Labor Day?” Labor History 14, no. 4 (Fall 1973): 612. “Labor Day.” Encyclopædia Britannica, 2014. http://www.britannica.com. Stewart, Estelle M. “Origin and Significance of Labor Day.” Monthly Labor Review 43 (1936): 279. News coverage of Labor Day, Philadelphia Inquirer, Wilmington (Del.) Sunday Morning Star, and Washington (Pa.) Observer-Reporter. George D. McDowell News Clippings Collection, Temple Urban Archives, Samuel Paley Library, 1210 Polett Walk, Philadelphia. Washington Park, Gloucester, N.J. (Now known as Washington Lake Park). Thanks, Scott! Labor Day has definitely gotten away from its union oriented labor roots. I’d bet few Philadelphians discuss labor conditions or workers’ rights as they fire up their grills on Monday. Philadelphia seems to have jumped on the bandwagon—right after New York and Boston—in 1887, when the Knights of Labor designated September 5th as “Labor Day.” Local Knights of Labor District Assemblies held picnics all over the city and sponsored excursions a full seven years before the 1894 Act of Congress. Great writing and research. Really thorough but concise at the same time. It’s a shame that the holiday has gotten away from it’s roots, but what do you expect. There’s another Phila. early Labor day connection that I just learned about last year. I live near St. Peter’s Village in Chester County where the stone cutters went on strike around the first Labor Day . The General Meade Statue dedication was scheduled for October. They were cutting and polishing the stone for the base. Decided it would be a good time to go on strike. There were also 300 African American workers from Richmond VA working in the quarries at that time Think they tried to bring workers in from Phila.